The appetite for offshore investing seems linked to the same barometer but sits on the other end of the see-saw. As the mood turns sombre locally, so the appetite for offshore seems to increase exponentially. Three investors were keen to invest offshore and enjoy the diversification benefits of different countries, industries and companies not available locally. They all had dramatically different approaches. Investor 1 made the decision to invest regularly, putting away R1 000 a month for 22 years. 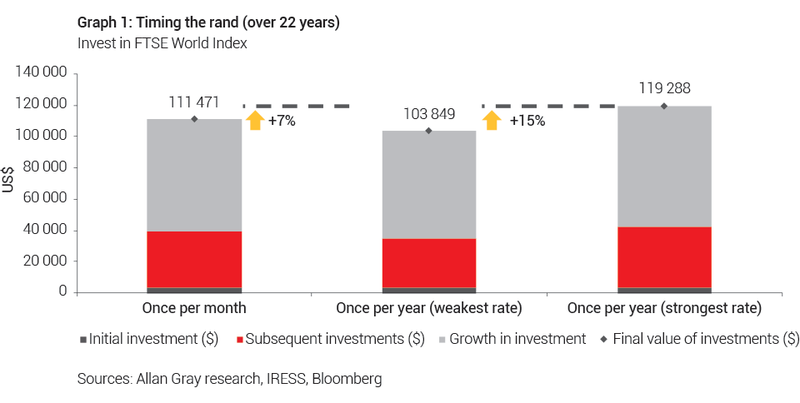 Investor 2 wanted to invest once a year at the most favourable exchange rate, but sadly always got his timing wrong, thus investing an amount of R12 000 at the worst exchange rate every year for 22 years. Investor 3 took the same approach as investor 2, but got it right, investing at the strongest exchange rate every year, for 22 years. As Graph 1 shows, the results for our three investors were quite predictable – investing at the best exchange rate got investor 3 the best results. However, while Graph 1 shows that investor 3 won the race, the range of outcomes was narrower than most investors would have expected. This provides an interesting lesson for us South Africans who are fixated on timing the rand: perhaps we should consider giving up the business of predictions in lieu of things within our control. At Allan Gray, we don’t believe we have any edge in this either and prediction could be summed up by Niels Bohr, a physicist who once said, “Prediction is very difficult, especially about the future”. It is impossible to accurately and consistently forecast the movements of the rand: there are just too many factors at play that we can’t control – from the mood and actions of local politicians, foreign investor sentiment, and the daily noise in global markets. Coupled with this is that global markets themselves are unpredictable, so even if we could pinpoint what our currency was going to do next, there is no telling if the right opportunities would be available offshore at that exact point in time. Our current circumstances are a case in point: the rand has recovered since its weak point last year, but assets in major developed markets such as the US are generally looking expensive. A better strategy is to figure out how much of your investment portfolio you want to place offshore and what you are trying to achieve and then formulate a plan to invest as regularly as possible in carefully selected assets. 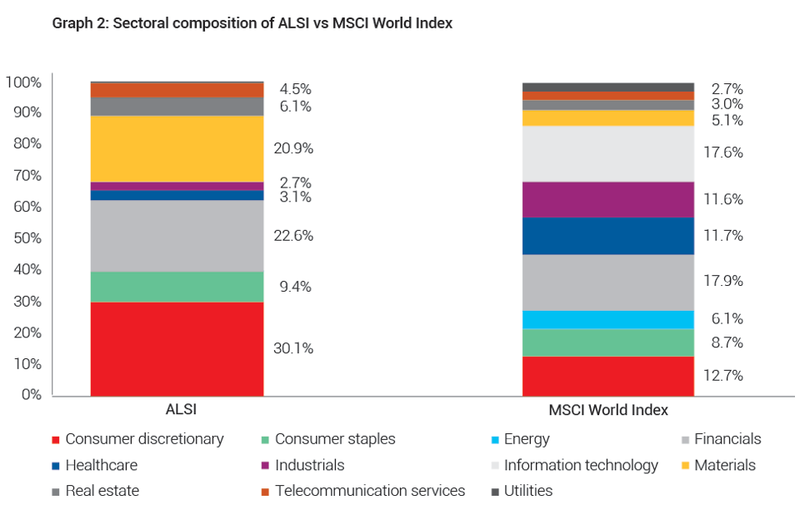 Arguably, it is more important spending your time identifying which global assets you want to invest in for the long term, than determining the exact perfect entry point – which as we know is impossible to do reliably. Everyone has their own goals and objectives when it comes to investing offshore. Perhaps you want to protect your purchasing power, or take advantage of opportunities that simply aren’t available – or it is a combination of both reasons. By investing in the Orbis funds, you are able to gain exposure to companies which simply don’t feature in our local market, and can benefit from the trends that are shaping markets globally. Graph 2 gives you a sense of the scope of the opportunity globally compared to in SA. And of course diversification is not just about different shares, but taking advantage of different asset classes. If your portfolio is well diversified you are not reliant on a single asset class to deliver your returns; instead you have the opportunity to get returns from various sources, so when one is doing poorly, another is likely to make up for it. In addition, our portfolio managers locally and globally are continuously scrutinising this opportunity set to determine how to invest your money between these various asset classes. What are we doing to help clients invest offshore? As part of our ongoing efforts to make offshore investing simpler for adviser and their clients, we have lowered the minimum investment amounts required to open and add to an account on the Allan Gray offshore investment platform. Interested investors can open an account with US$1 500 (or foreign currency equivalent).